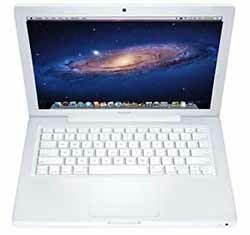 Apple MacBook Core 2 Duo Unibody T7550 2.26GHz 2GB RAM 250GB HD SuperDrive DVD±RW DL 13.3" AirPort/Bluetooth w/Webcam - SPECIAL! Includes shipping! Lowest Ever Price! 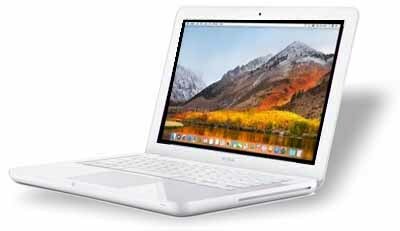 Later model MacBook takes up to High Sierra (10.13) Web Cam equipped and backed by an Intel Core 2 Duo T7550 2.26 GHz processor and 2 GB of DDR2 RAM, 13-Inch (White Polycarbonate "Unibody" - Late 2009) Large 250GB Hard Drive (call for options) Fully updated OSX 10.6.8 Snow Leopard comes pre-installed (up to Sierra capable, call for options). Enjoy hours of entertainment with applications like GarageBand, iMovie, or iTunes. The built in SuperDrive burns and plays CD's and DVD's. It also features a NVIDIA GeForce 9400M "graphics processor with 256 MB of SDRAM shared with main memory" and a 13.3" widescreen TFT active-matrix LED-backlit "glossy" display (1280x800 native resolution). Integrated HD audio with built-in speakers. Built-in 10/100/1000 Gigabit Ethernet. AirPort Extreme wireless card (WiFi 802.11n) pre-installed. Built-in BLUETOOTH 2.0+ EDR (Enhanced Data Rate) module. Keyboard with touchpad. Built-in iSight WEBCAM and omnidirectional microphone. It has USB 2.0 ports, a single audio in/out port, and a Mini DisplayPort that supports an external display at 2560x1600. It does not have a Firewire port or IR to support a remote. Magsafe Power Adapter included. Like the aluminum "Unibody" models, this system also has a four-finger "multi-touch" glass trackpad. Good used 6-cell Lithium ion Polymer Battery (new ones available $94.99 and we install these free with purchase). Thoroughly tested and nicely configured as all our refurbished systems are. We include our SuperSink DVD chock full of freeware and shareware. Was $349.77 NEW LOWER PRICE $299.77 includes domestic shipping. We recommend RAM UPGRADES for later OS versions up to 8GB available call. 2GB stick $45, 4GB $75. Unit comes with 2 1GB sticks preinstalled. Will hold up to 8GB RAM. New FireCuda Solid State Hybrid Hard Drives 500, 1 or 2TB upgrades available, new batteries, call for options. SPECIAL GOOD WHILE QUANTITIES LAST ORDER NOW! 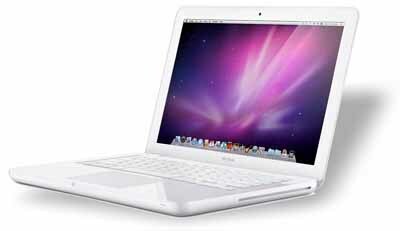 Apple MacBook Core 2 Duo P8600 2.4GHz 2GB RAM 250GB HD SuperDrive DVD±RW DL 13.3" AirPort/Bluetooth w/Webcam Unibody - SPECIAL! LOWER PRICE on this later faster model! Up to High Sierra 10.13 compatible. Great for School, Office or Home use! 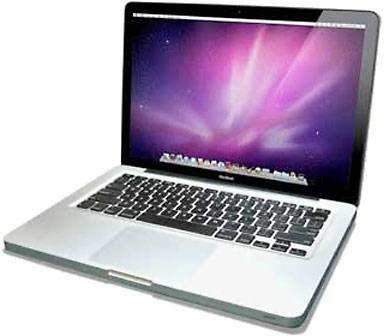 Web Cam equipped and backed by an Intel Core 2 Duo P8600 2.4 GHz processor and 2 GB of DDR2 RAM, this MacBook is ready to tackle both heavy workloads and play-related commands. The 250 GB hard drive provides room for an expanding multimedia library. Fully updated OSX 10.6.8 Snow Leopard comes pre-installed (up to High Sierra capable with more RAM, call). The Intel "Core 2 Duo" (P8600) 45 nm "Penryn" processor includes two independent processor "cores" on a single silicon chip. Enjoy hours of entertainment with applications like GarageBand, iMovie, or iTunes. The built in SuperDrive burns and plays CD's and DVD's. You'll notice the outstanding, GeForce 320M "graphics processor 256MB shared with main memory", and a 13.3" widescreen TFT active-matrix "glossy" display (1280x800 native resolution). Integrated HD audio with built-in speakers. Built-in 10/100/1000 Gigabit Ethernet. AirPort Extreme wireless card (WiFi 802.11n) pre-installed. Built-in BLUETOOTH 2.1+ EDR (Enhanced Data Rate) module. Keyboard with touchpad. Built-in iSight WEBCAM and omnidirectional microphone. One Mini-DVI (video out). Two USB2 Ports and Audio in and out. It does not have a Firewire port. Magsafe Power Adapter and good used 6-cell Lithium ion Polymer Battery (new ones available $94.99 and we install these free with purchase). Thoroughly tested and nicely configured as all our refurbished systems are. We include our SuperSink DVD chock full of freeware and shareware. WAS $749.77 SALE $399.77! price includes domestic shipping. RAM UPGRADES to 8GB available call. 2GB stick $45, 4GB $75. Unit comes with 2 1 GB sticks preinstalled. New FireCuda Solid State Hybrid Hard Drives 500, 1 or 2TB upgrades available, New Batteries, call for options. iMac 20" Aluminum Core 2 Duo 2.4 GHz, 2GB RAM, 250GB HD, DVD Burner SuperDrive, AirPort WirelessN, w/Webcam & Bluetooth, includes shipping! LOWEST EVER PRICE! Great system for home, or office! Run up to EL CAPITAN 10.11.6! The built-in 20-inch glossy widescreen TFT active-matrix LCD offers an impressive 1680x1050 resolution and has all the Apple software you need with iPhoto, iMovie, iTunes, iPhoto, and GarageBand included! These iMacs is powered by an Intel Core 2 Duo 2.4 GHz processor and 2 GB DDR2 SDRAM so it can handle all your computing tasks with ease! 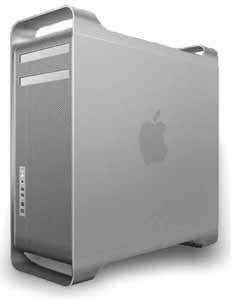 Store your multimedia life on its 250 GB 7200 RPM hard drive and compute in a simple and easy-to-use environment with OSX 10.6.8 pre-installed. Load more software, music, photos, and data with the built-in slot-loading DVD±RW DL SuperDrive. Snap pictures and video-chat with friends and family using the built-in iSight camera. Connect to high-speed networks and the Internet with the built-in AirPort Extreme N wireless and built-in 10/100/1000BASE-T Gigabit Ethernet. Add wireless peripherals with Bluetooth 2.1+EDR support. Firewire 800/400, 3 USB 2 ports. OSX10.11 El Capitan capable comes with OSX 10.6.8 Snow Leopard preinstalled (call for options). Aftermarket Keyboard and Mouse included. Our SuperSink DVD chock full of Freeware and Shareware is included. VALUE $399.77 LOWEST EVER $299.77 price includes domestic shipping. These units use the faster 6400 RAM upgrades: 2 slots comes with 2 1GB chips, add a 4GB stick for $109 or 2 GB stick for $32 Max. 6GB. We can install the new SUPERFAST Hybrid 1 or 2 TB Hard Drives (call). iMac 20" Aluminum Core 2 Duo 2.66 GHz, 2GB RAM, 320GB HD, DVD Burner SuperDrive, AirPort WirelessN, w/Webcam & Bluetooth, includes shipping! Great FASTER system for home, school or office! FASTER Penryn Processors! The built-in 20-inch glossy widescreen TFT active-matrix LCD offers an impressive 1680x1050 resolution and has all the Apple software you need with iPhoto, iMovie, iTunes, iPhoto, and GarageBand included! These iMacs is powered by an Intel Core 2 Duo 2.66 GHz processor with two independent processor "cores" on a single silicon chip, a 6 MB shared level 2 cache and 2 GB DDR3 SDRAM so it can handle all your computing tasks with ease! Store your multimedia life on its larger 320 GB 7200 RPM hard drive and compute in a simple and easy-to-use environment with OSX 10.6.8 pre-installed. Load more software, music, photos, and data with the built-in slot-loading DVD±RW DL SuperDrive. Snap pictures and video-chat with friends and family using the built-in iSight camera. Connect to high-speed networks and the Internet with the built-in AirPort Extreme N wireless and built-in 10/100/1000BASE-T Gigabit Ethernet. Add wireless peripherals with Bluetooth 2.1+EDR support. 1 Firewire 800, 4 USB 2 ports. FAST graphics with 256 MB of memory, and built-in stereo speakers underneath the 20" glossy TFT Active Matrix LCD (1680x1050 native) display. Up to OSX10.11 El Capitan capable (more RAM required) comes with OSX 10.6.8 Snow Leopard preinstalled (call for options). Aftermarket Keyboard and Mouse included. Our SuperSink DVD chock full of Freeware and Shareware is included. EVEN LOWER $349.77 price includes domestic shipping. These units use 2 slots comes with 2 1GB chips, Upgrades: 2 slots comes with 2 1GB chips, add a 4GB stick for $115 or 2 GB stick for $40 6GB Maximum. Optionally we can install the new 1 or 2 Terabyte Seagate Hybrid Drives for more capacity and speed. Call for options. SPECIAL BOSS VERSION! We upgrade the RAM to 6 GB and install a NEW 500GB Seagate Solid State Hybrid Hard Drive. Runs up to High Sierra. This MacBook Pro "Core i5" 2.3 13-Inch (Early 2011/Thunderbolt) features a 32 nm "Sandy Bridge" 2.3 GHz Intel "Core i5" processor (2415M), with two independent processor "cores" on a single silicon chip, a 3 MB shared level 3 cache, UPGRADED to 6GB of 1333 MHz DDR3 SDRAM (PC3-10600) installed in pairs (1- 4GB and 1-2GB modules, upgradeable to 16GB), we upgrade to a NEW 500GB Seagate Solid State Hybrid Drive, an 8X DL "SuperDrive", an Intel HD Graphics 3000 graphics processor that shares 384 MB of memory with the system, an integrated FaceTime HD webcam, and an LED-backlit 13.3" widescreen TFT active-matrix "glossy" display (1280x800 native resolution). Connectivity includes AirPort Extreme (802.11a/b/g/n), Bluetooth 2.1+EDR, Gigabit Ethernet, a Firewire "800" port, two USB 2.0 ports, audio in/out, an SDXC card slot, and a new "Thunderbolt" port that is backwards compatible with Mini DisplayPort and, likewise, supports an external display at 2560x1600 and passes an audio signal. Thunderbolt also supports other peripherals that use the Thunderbolt standard which provides up to 10 Gbps of bandwidth in both directions. We configure these for Snow Leopard 10.6.8 but call for options. FREE SuperSink DVD chock full of freeware and shareware. Our $699.77 price includes domestic shipping. RAM upgrades 4GB Chip $46, 8GB $75, room for 2. New Solid State Hybrid Drives in 500GB $85 and 1TB $110 available, call to order options. Runs up to High Sierra. This MacBook Pro "Core i5" 2.3 13-Inch (Early 2011/Thunderbolt) features a 32 nm "Sandy Bridge" 2.3 GHz Intel "Core i5" processor (2415M), with two independent processor "cores" on a single silicon chip, a 3 MB shared level 3 cache, 4 GB of 1333 MHz DDR3 SDRAM (PC3-10600) installed in pairs (two 2 GB modules, upgradeable to 16GB), a 320 GB Serial ATA (5400 RPM) hard drive, an 8X DL "SuperDrive", an Intel HD Graphics 3000 graphics processor that shares 384 MB of memory with the system, an integrated FaceTime HD webcam, and an LED-backlit 13.3" widescreen TFT active-matrix "glossy" display (1280x800 native resolution). Connectivity includes AirPort Extreme (802.11a/b/g/n), Bluetooth 2.1+EDR, Gigabit Ethernet, a Firewire "800" port, two USB 2.0 ports, audio in/out, an SDXC card slot, and a new "Thunderbolt" port that is backwards compatible with Mini DisplayPort and, likewise, supports an external display at 2560x1600 and passes an audio signal. Thunderbolt also supports other peripherals that use the Thunderbolt standard which provides up to 10 Gbps of bandwidth in both directions. We configure these for Snow Leopard 10.6.8 but call for options. FREE SuperSink DVD chock full of freeware and shareware. Used good battery, new available. Our $599.77 price includes domestic shipping. RAM upgrades 4GB Chip $46, 8GB $75, room for 2. New Solid State Hybrid Drives in 500GB $85 and 1TB $110 available, call to order options. Do you need to run the latest OS version? 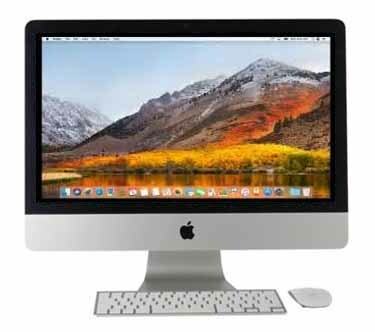 SUPER PRICE DROP on this FAST iMac "Core i3" 3.06 21.5-Inch Aluminum (Mid-2010) is powered by a dual core 3.06 GHz Intel "Core i3" I3-540 (Clarkdale) processor with a dedicated 256k level 2 cache for each core and a 4 MB shared level 3 cache. In lieu of a system bus, it has a "Direct Media Interface" (DMI) that "connects between the processor and chipset" at 2.5 GT/s. Our refurbished unit is configured with 4 GB of RAM (1333 MHz PC3-10600 DDR3 SDRAM), a 500 GB (7200 RPM) hard drive, a vertically-mounted slot-loading DVD±R DL "SuperDrive", and ATI Radeon HD 4670 graphics with 256 MB of dedicated GDDR3 memory. It also has a built-in iSight video camera and built-in stereo speakers underneath the 21.5" glossy 16:9 LED-backlit TFT Active Matrix LCD (1920x1080 native) display "with IPS technology". Connectivity includes four USB 2.0 ports, a Firewire "800" port, built-in AirPort Extreme (Wireless N), and Gigabit Ethernet, as well as an audio capable Mini DisplayPort, which supports an external display up to 30" (2560x1600). Built-in Bluetooth 2.1+EDR. Built-in Microphone. Externally, this iMac uses "edge-to-edge" glass design and "seamless all aluminum enclosure". This iMac includes a Keyboard and Mouse" OSX 10.13 HIGH SIERRA capable comes with OSX 10.6.8 Snow Leopard preinstalled (or call for options). Our SuperSink DVD chock full of Freeware and Shareware is included. WAS $699 REDUCED PRICE $499.77 price includes domestic shipping. This unit can take up to 16GB of RAM, 4GB Chip $45, 8GB Chip $80, room for 2. Lion capable and Web Cam equipped and backed by an Intel Core 2 Duo T7200 2.0 GHz processor and 1 GB of DDR2 RAM (expandable) 80 GB Hard Drive. Fully updated OSX 10.6.8 Snow Leopard comes pre-installed. We install Roccat a fully updated and compatible web browser. We also install Sheepshaver which allows 9.0.4 emulation allowing you to run classic programs. Enjoy hours of entertainment with applications like GarageBand, iMovie, or iTunes. Burn and play CDs or watch DVD movies with the CD-RW/DVD combo drive. You'll notice the outstanding, crisp picture quality on the 13.3-inch glossy widescreen TFT LCD display (1280x800) with Intel GMA 950 graphics with 64 MB or DDR2 SDRAM shared with main memory. Integrated HD audio with built-in speakers. Built-in 10/100/1000 Gigabit Ethernet. AirPort Extreme wireless card (WiFi 802.11n) pre-installed. Built-in BLUETOOTH 2.0+ EDR (Enhanced Data Rate) module. Keyboard with touchpad. Built-in iSight WEBCAM and omnidirectional microphone. One Mini-DVI (video out). Two USB2 Ports and a Firewire 400 port with Audio in and out. Magsafe Power Adapter and good used battery (new ones available extra). Thoroughly tested and nicely configured. FREE SuperSink DVD chock full of freeware and shareware. SALE $149.77 price includes domestic shipping. Upgrade to 2 GB RAM for $30. LIMITED QUANTITIES, ORDER NOW! 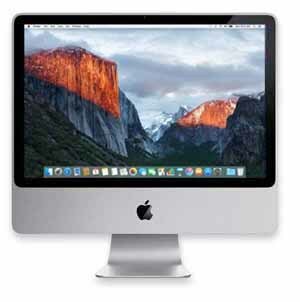 21.5" iMac Core i7-Quad-Core 3.1Ghz, 16GB RAM, 1TB HD, NVIDIA 512MB, Airport, Webcam & Bluetooth. FAST and THIN! PRICE REDUCED AGAIN! LIKE NEW! THIS IS THE FASTEST MAC I HAVE EVER USED! This 21.5" iMac Core i7-Quad-Core 3.1Ghz Aluminum features a 22 nm Quad Core 3.1 GHz Intel "Core i7" I7-3770S (Ivy Bridge) processor with four independent processor cores on a single chip, an 8 MB shared level 3 cache, This one was STUFFED at purchase time with 16 GB of 1600 MHz DDR3 SDRAM, a 1 TB (5400 RPM) hard drive, and a NVIDIA GeForce GT 650M graphics processor with 512 MB of dedicated GDDR5 memory. 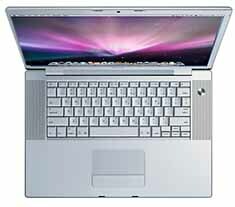 It also has a built-in "FaceTime HD" webcam and stereo speakers, NO OPTICAL DRIVE, too thin (call for options). This model has a 21.5" 1920x1080 LED-backlit 16:9 widescreen IPS display with the "cover glass fully laminated to the LCD and anti-reflective coating." The rear of the case is aluminum and is thicker in the middle and tapers to a razor thin 5 mm at the edges. Connectivity includes four USB 3.0 ports, dual Thunderbolt ports, Gigabit Ethernet, 802.11n, and Bluetooth 4.0. This iMac model include a compact aluminum Apple Wireless Keyboard and a Mouse. Will take OSX10.8 Mountain Lion up to the latest, OS10.13 High Sierra preinstalled (call for options). VALUE $1299, $899.77 price includes domestic shipping. 90 day warranty on systems. Want a larger iMac, we special order and build to suit! Call! ONE ONLY! ORDER NOW! SPECIAL BOSS VERSION! We upgrade the RAM to 8 GB and install a NEW 1 Terabyte Seagate Solid State Hybrid Hard Drive. 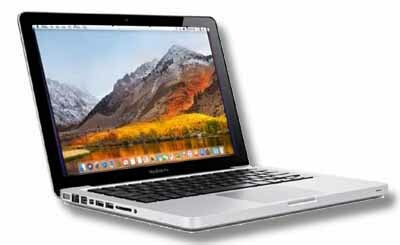 The MacBook Pro "Core i7" 2.4 15-Inch (Late 2011) features a 32 nm "Sandy Bridge" 2.4 GHz Intel "Core i7" processor (2760QM), with four independent processor "cores" on a single silicon chip, a 6 MB shared level 3 cache, Upgraded to 8 GB of 1333 MHz DDR3 SDRAM (PC3-10600) installed in pairs (two 4 GB modules), and an Upgraded 1 Terabyte Solid State Hybrid Drive, this unit also features an 8X DL "SuperDrive", dual graphics processors -- an AMD Radeon HD 6770M with 1 GB of dedicated GDDR5 memory and an Intel HD Graphics 3000 graphics processor that shares 384 MB of memory with the system -- and an integrated FaceTime HD webcam. The standard configuration of this model has an LED-backlit 15.4" widescreen TFT active-matrix "glossy" display (1440x900 native resolution). Connectivity includes AirPort Extreme (802.11a/b/g/n), Bluetooth 2.1+EDR, Gigabit Ethernet, a Firewire "800" port, two USB 2.0 ports, separate audio in and out ports, an SDXC card slot, and a "Thunderbolt" port that is backwards compatible with Mini DisplayPort and, likewise, supports an external display at 2560x1600 and passes an audio signal. Thunderbolt also supports other peripherals that use the Thunderbolt standard which provides up to 10 Gbps of bandwidth in both directions. Runs up to High Sierra 10.13. Call for options. FREE SuperSink DVD chock full of freeware and shareware. RAM upgrades 8GB $75, room for 2. Call for RAM upgrades. Our $799.77 price includes domestic shipping. I run one of these myself! This Apple Mac Mini delivers amazing power in a super-compact design! With the HDMI out it easily connects to most Big Screens! I have one attached to our home big screen. Enjoy online entertainment! This unit comes with the Intel Core 2 Duo P8600 Dual-Core 2.4GHz processor, L2 Cache: 3 MB, 4 GB of DDR3 SDRAM (expandable up to 16 GB), 320 GB Serial ATA hard drive (we have larger faster hybrid drives available extra). The Slot-loading DVD±RW SuperDrive burns DVDs & CD's. Built in NVIDIA GeForce 320M graphics. Built in Airport Extreme N, 1000base-T Networking with Bluetooth 2.1 EDR. PORTS: One (1) HDMI, One (1) Mini DisplayPort, One (1) FireWire 800 port, Four (4) USB 2.0 ports, Mini Headphone and Microphone Ports. We have adapters available. This system comes with OSX10.6.8 nicely configured but is capable or running through 10.13 High Sierra (call for options). While this unit comes with a power cord, the keyboard and mouse are extra. Use your old one or order from out input section any of the USB items. It comes with a Mini Display to DVI adapter. We carry HDMI cables and other display adapters see our monitors section. We also include our OSX Super Sink DVD with lots of Shareware and Freeware. RAM upgrades 4GB Chip $46, 8GB $75, room for 2. New Solid State Hybrid Drives in 500GB $85, 1TB $99, and $140 2TB available, call to order options. Was $599, NOW $499.77 price includes domestic shipping. ORDER KEYBOARD AND MOUSE in the Input section or see below. Apple Mac Mini Core Duo 1.83 GHz 1GB RAM, 80GB HD, Combo Drive, AirPort & Bluetooth, includes DVI (DVI-to-VGA adapter included) $129.77 Includes Shipping! Connect one of these to your Big Screen TV and enjoy all kinds of online Multimedia. The stock DVI may work for many but we carry HDMI and VGA adapters and cables. The Apple Mac mini "Core Duo" 1.83 features a 1.83 GHz Intel "Core Duo" processor, a 2 MB on-chip level 2 cache, a 667 MHz frontside bus, upgraded to 1 GB of 667 MHz DDR2 SDRAM (PC2-5300) memory, a 5400 RPM, 80 GB Serial ATA hard drive, a slot-loading 2.4X "Combo Drive" Play DVD, read and write CD's, and an "Intel GMA950 graphics processor with 64 MB of DDR2 SDRAM shared with main memory." Connectivity includes DVI (DVI-to-VGA adapter included) and Firewire "400", four USB 2.0 ports, combined "optical digital audio input/audio line in" and combined "optical digital audio output/headphone" minijacks, a 1000Base-T Gigabit Ethernet port, and built-in AirPort Extreme (802.11G) and Bluetooth 2.0+EDR. Unit Dimensions: 2"x6.5"x6.5". Unit includes a power cord. Keyboard and Mouse available extra. Use your old one or order from out input section any of the USB items (or see below). Each unit is thoroughly cleaned and tested with Snow Leopard OSX10.6.8 nicely configured with SheepShaver OS9.04 so you can use your old applications. We include our OSX Super Sink DVD chock full of freeware and shareware. Max out the MEMORY add 2-1GB Chips (in place of the 2-512s) for $30 installed. Was $299.77 NOW $129.77 price included domestic shipping. Older unit fully updated OSX 10.6.8 Snow Leopard comes pre-installed (software available extra, call for other options). MacBook Pro "Core Duo" 2.0 15-Inch features a 2.0 GHz "Core Duo" processor (T2500), with two independent processor "cores" on a single silicon chip, a 2 MB shared "on chip" level 2 cache, a 667 MHz frontside bus, UPGRADED to 2 GB of 667 MHz PC2-5300 DDR2 SDRAM, an 80.0 GB hard drive with "Sudden Motion Sensor" technology, and a 4X single-layer DVDRW/CD-RW SuperDrive. It also includes an ATI Mobility Radeon X1600 graphics processor with 128 MB of GDDR3 video memory and dual-link DVI functionality, and a 15.4" GLOSSY widescreen 1440x900 TFT active-matrix display. Enjoy hours of entertainment with applications like GarageBand, iMovie, or iTunes. Burn and play CDs or DVD with the Slot-loading SuperDrive DVD±RW. Built-in 10/100/1000 Gigabit Ethernet. AirPort Extreme wireless card pre-installed. Use the built-in Bluetooth wireless technology to connect to your smartphone or other Bluetooth compatible devices. Keyboard with touchpad. Built-in iSight WEBCAM and omnidirectional microphone. One DVI-I (video out). USB 2.0, FireWire 800, FireWire 400 and audio ports including an ExpressCard/34 slot for easy connection to external devices! One (1)ExpressCard/34 slot. Magsafe Power Adapter and used battery fair condition (new ones available extra). Thoroughly tested and nicely configured. FREE SuperSink DVD chock full of freeware and shareware. Our $229.77 price includes domestic shipping. ONE ONLY ORDER NOW! Apple MacBook with a black and silver design reminiscent of the Aluminum iMac models, the "Unibody" MacBook "Core 2 Duo" (Late 2008/Aluminum) models introduced an all new case design milled from a single block of aluminum providing greater strength, reduced weight, and a superior finish than previous systems. This freshly refurbished unit features a 45nm "Penryn" 2.0 GHz Intel "Core 2 Duo" processor (P7350), with two independent processor "cores" on a single silicon chip, a 3 MB shared "on chip" level 2 cache, a 1066 MHz frontside bus, UPGRADED TO 4 GB of 1066 MHz DDR3 SDRAM (PC3-8500) installed in pairs (two 2 GB modules), a 160 GB Serial ATA (5400 RPM) hard drive, an 8X DL "SuperDrive", a NVIDIA GeForce 9400M "graphics processor with 256 MB of DDR3 SDRAM shared with main memory", integrated iSight, and an LED-backlit 13.3" widescreen TFT active-matrix "glossy" display (1280x800 native resolution). Connectivity includes AirPort Extreme (802.11N), Bluetooth 2.1+EDR, Gigabit Ethernet, two USB 2.0 ports, optical digital/analog audio in/out, and a new "Mini DisplayPort" that supports an external display at 2560x1600. It does not include a Firewire "400" port. Magsafe Power Adapter included. Good used Battery (almost new). Will run from 10.6 Snow Leopard up to 10.11 El Capitan. Thoroughly tested and nicely configured as all our refurbished systems are. We include our SuperSink DVD chock full of freeware and shareware. Will hold up to 8GB, 4GB RAM $50. New FASTER FireCuda Solid State Hybrid Hard Drives 1 or 2TB upgrades available. Was $379.77 NEW LOWER PRICE $329.77 includes domestic shipping. ONE ONLY ORDER NOW!